The Rockbox Christmas Celebration is here! Christmas at the Rockbox has Christmas favorites along with serious fun! Come join some of our Holiday Tribute Artists as we entertain the whole family with a Christmas event that will be talked about all year long. There will be classic Christmas songs along with some comedy to make your Christmas brighter! The variety of music will be as wide as Santa’s belly. Treat yourself to a Christmas treasure here at the Roxkbox. Reservations recommended. Please check the website for additional special Christmas Eve showtimes and to purchase tickets. Fridays at 8 pm; Saturdays at 4:30 and 8 pm; Sundays at 3 pm. $32 – $42 per adult; $17 youth. Group rates available. Announcing a huge new fundraising event that will have you wobbly at the knees. In jeopardy of being a memory from holidays past, Heritage School has rescued Eisbahn, this popular seasonal ice skating event. Given its popularity, and with the majority of proceeds now benefiting Heritage School, you could say it’s part fundraising, part community service. This is quite possibly the biggest fundraising opportunity Heritage School has ever had, and it has the potential for an even bigger reward. Please call 830/992-9659 or 830/997-6597 for more information. Thomas Micheal Riley will play at this year’s Thanksgiving show in Luckenbach Texas. 9 to 11 pm. Admission $15 per person. Tickets on sale online. Call (830) 997-3224 for more information. Hill Country communities light up to celebrate the Holiday Season. Self-guided driving tour through participating towns where Main Streets and Town Squares are all decked out their finest. Please visit the website for more information or pick up the brochure that will be available in the Fredericksburg Visitor Information Center at 302 E. Austin. Call (830) 997-8515 for more information. This annual event at Fort Martin Scott, 1606 E. Main St., features living history re-enactors, pioneer crafts, chuckwagon food, old-west shootouts, Native Americans, storytellers, musicians and hands-on activities for the kids. There’s something for the entire family! 10 am to 4 pm. Free admission. Call (830) 997-7521 for more information. The Peddler Show is celebrating 37 years as Texas’ favorite arts and crafts show! At the Gillespie County Fairgrounds. Friday noon to 7 pm; Saturday 9 am to 6 pm; Sunday 11 am to 4 pm. $6 adults; $5 seniors 65+; $5 kids ages 5 – 11; under 5 free. 540 Fair Drive on Hwy 16 South. Call (800) 775-2774 for more information. Cost is $25 for early registration which includes a t-shirt and chip timing. One mile Fun Run cost is $10 which includes a t-shirt and participation ribbon. Race day registration at Fredericksburg Elementary School, 1608 N. Adams. starting at 7 am. Visit the website and search FREDERICKSBURG TEXAS TURKEY TROT to register and get more details. Or call (310) 462-2186. Shop with over 350 vendors. You will find 6 barns and acres of antiques, collectibles, tools, crafts, shabby chic, primitives, candles, hunting accessories, jewelry, unique clothing, food and so much more. Relax in the Biergarten while listening to live music. Friday and Saturday 9 am to 6 pm; Sunday 9 am to 4 pm. $5 parking fee good all three days. 7 miles east on Hwy 290. Call (210) 846-4094 for more information. Local vendors will be selling home decor, jewelry, art work and much more. Along with Christmas gifts, Friendly Natives will also be selling Christmas trees, garland and wreaths. There will be a raffle and live music by Davey Schrank. Refreshments will be provided by The Peach Basket. 3 pm to dark at 1107 N. Llano. Call (830) 997-6288 for more information. Fredericksburg Trade Days at Sunday Farms is squeezing in an extra weekend of fabulous shopping for the Thanksgiving weekend! 9 am. Call (830) 685-3636 for more information. Dinner, drinks, live auction, silent auction, door prizes and other prize drawings. Event to support agriculture, youth education and rural living in the Hill Country. At the Gillespie County Fairgrounds, 540 Fair Drive on Hwy 16 South. Gates open at 5:30 pm; food served from 6 to 8:30 pm. $20 per person. Call 830-997-5508 for more information. Nine “off Main” stores have banded together to offer ‘Tis The Season, an evening shopping event to put you ready for the holidays! In addition to opening their doors for late shopping, stores will offer snacks, music, special discounts or other surprises. Shoppers will have the opportunity to fill out a punch card for each store visited. Those who visit all stores will be entered in a drawing to win one of nine prizes valued from $25 to $500. Participating stores include the Red Baron Antique Mall, Fredericksburg Antique Mall, Smitten, The Farmhouse, Henfeathers, Jabberwocky, Lone Star Antique Mall, The Attic and Timeless Menagerie. 5 to 9 pm. Call (469) 358-9414 for more information. The Fredericksburg Farmers Market and Pioneer Museum are partnering to extend the popular weekly event into the fall. Every Thursday, starting on October 4, shoppers can pick up fresh farm produce and prepared food in a historic setting. Hours are 4 to 6:30 p.m. Fall market will continue for seven weeks through November 15. Shoppers can enjoy live music each week. The Pioneer Museum is located at 325 West Main Street in Fredericksburg. There will be free admission to the museum and grounds during market hours. For information, contact the Pioneer Museum at 830-997-2835. Come to the National Museum of the Pacific War, 340 E. Main Street, for a 40′s night club experience – enjoy the best of jazz for dancing and a full slate of cocktails from the 1940s and from the military during World War II. The program will be presented by renown mixologist, author and historian, Philip Greene, from the Museum of the American Cocktail in New York City. To be held in the Nimitz Ballroom of the National Museum of the Pacific War. Live music by the Kris Kimura Quartet. 7:30 to 11 pm. Tickets are $50 per person and are available online. Routes of 25, 42 and 58 miles over scenic and little-traveled farm to market roads and country lanes. Post-ride meal provided. To register and for more information, please visit the website. Start is at the Tatsch House at Lady Bird Johnson Municipal Park on Hwy 16 South. Sponsored by the Hill Country Bicycle Touring Club. Join Pedernales Cellars, 2916 Upper Albert Rd., is celebrating its seasonal dessert wine which has been made based on a Swedish family recipe from Pedernales’ owner Fredrik Osterberg. Dubbed “Christmas in a bottle”, Glögg is the perfect complement to holiday meals. 11 am to 5 pm. Call (830) 644-2037 for more information. See fine art on exhibit and for sale. Hours of event are: Friday, November 8th 6PM - 9PM, Saturday, November 9th 9AM - 5PM, and Sunday, November 10th 9AM - 5PM, and will be held at St. Joseph's Halle, 212 West San Antonio Street, in Fredericksburg, Texas. An evening of fun, food and rock ‘n roll! Live music featuring T. J. Smith and his Rock Box All-Stars! All you can eat 50′s menu! Classic car show! Silent auction! Drinks and Dancing! Don’t miss this fundraiser for the Fredericksburg Theater Company! At the Steve W. Shepherd Theater, 1668 S. US Hwy 87. 5 pm to midnight. $50 per person. Call (830) 997-3588 for more information. 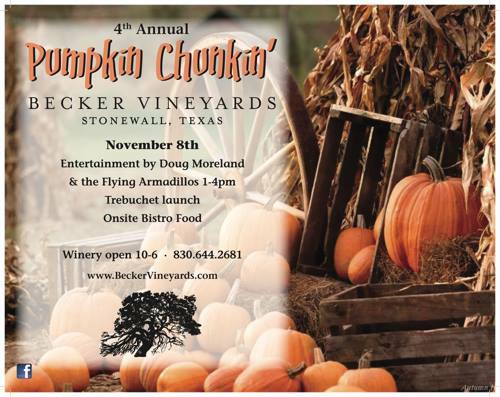 Those fun folks at Becker Vineyards are dusting off the trebuchet (a medieval engine of war with a sling for hurling missiles – or pumpkins!) in celebration of fall. Live music by Doug Moreland & The Flying Armadillos. Concessions will be available along with wine tasting and pumpkin recipe cooking and sampling. Noon – launching pumpkins every 30 minutes or so. 11 miles east on Jenschke Lane off of Hwy 290. Call (830) 644-2681 for more information. Johnny Nicholas’s 17th Annual Big Band Bash at Hill Top Café, 10661 N. US Highway 87. Dinner shows and concerts with big name artists. Johnny Nicholas himself is a world-renowned bluesman and former Asleep at the Wheel lead singer and writer. Over $60k in the form of college scholarships, workshops and band instruments for Fredericksburg performing arts students has been raised from past events. The event has been extended to three nights and dinner show tickets are $75 per person per night and include a surprise guest artist each night.